For those who have not had the pleasure of visiting Winnipeg or the Canadian Museum for Human Rights, the museum is worth visiting just for the architecture. For those who have not had the pleasure of visiting Winnipeg or the Canadian Museum for Human Rights, the museum is worth visiting just for the architecture. According to Wikipedia, the museum opened in 2014, at a final cost of $351m. Two years behind schedule, $41m over-budget. Three varieties of ancient stone play significant roles in the building, each of which were sourced from different parts of the globe. Tyndall Stone: The building entry’s “roots” and the upper floor “mountains” showcase Manitoba’s own Tyndall stone. This cream-coloured, mottled limestone was quarried near the town of Garson. It’s commonly used throughout the province as a building material for landmarks such as the Legislative Building. It contains small fossils of prehistoric marine creatures. Basalt: The columns in the Stuart Clark Garden of Contemplation are made from basalt that formed millions of years ago, when volcanic lava cooled rapidly into pillar-like structures. These columns have a hexagonal, or other polygonal, shape. 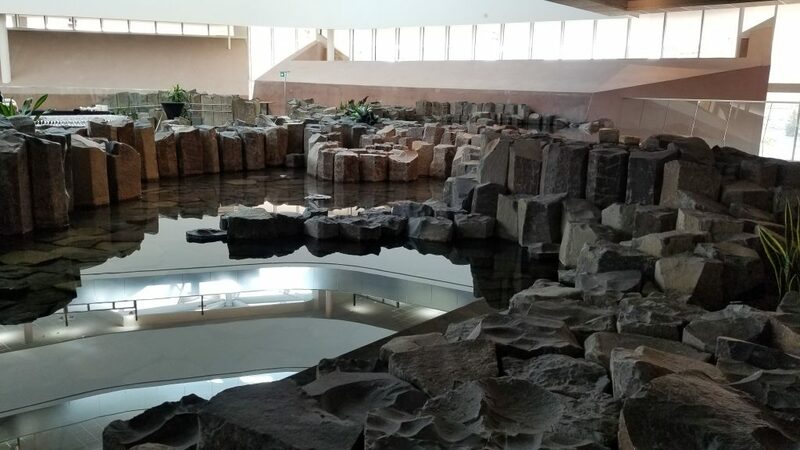 The Museum’s basalt comes from Inner Mongolia. The Garden of Contemplation, with its reflective pools, medicinal plants, winged cloud, and landscape of volcanic basalt.